Preheat the oven to 180°C. Line a 26 x 16cm (base measurement) slice tin with non stick baking paper, extending over the two long sides. Pull all the flesh from the trout, discarding the skin and bones. Flake the flesh and place into a large bowl. Squeeze out excess liquid from the zucchini. Add to the bowl along with the onions, dill and lemon rind; mix well. Whisk the eggs and sour cream. Add to the bowl, stir to combine and season with salt and freshly ground black pepper. Pour into the prepared tin. Bake for 25-30 minutes, until set and golden brown. Stand in the tin for 5 minutes, then lift onto a wire rack, and carefully slide out the paper. Cool completely. 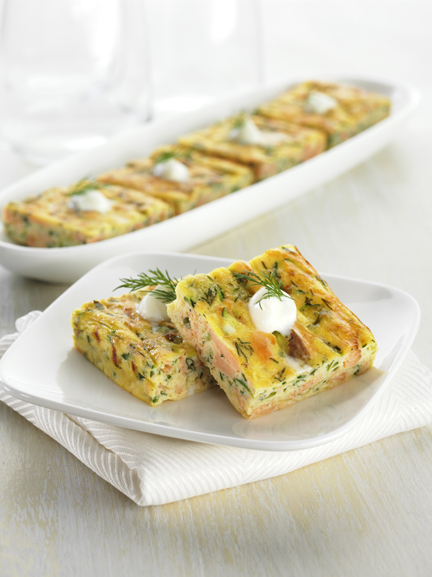 Cut into 24 squares and place onto a serving platter. Top each piece with a small dollop of sour cream, and a dill sprig.